I'll call Carex trifida a New Zealand native, though it is sourced from the islands in the southern ocean. 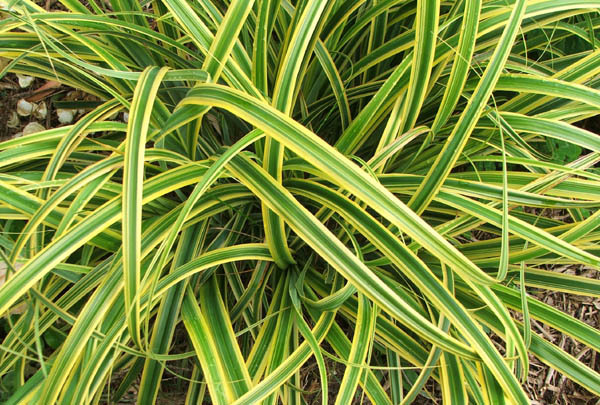 It's obviously a texture-lover's plant, with a beautiful fountain shape and the strongest leaves. Even when the fierce nor-west winds blow through my garden Carex trifida doesn't move a leaf. Nor does it flop or push itself outwards onto neighbouring plants. Hmm... It all seems far too good to be true. I also grow a coarse-leafed green carex that drops a million seedlings in a thousand different places. I'm wonder if the two are related? So far I have three of these grasses growing by the water's edge of my irrigation pond. A fourth sits in a new garden border, as part of a fill-it-up with left-overs planting plan. All were found desperately reduced in price on the nursery sale table. 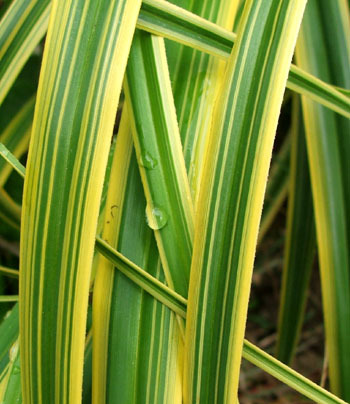 I'm a great fan of foliage plants, and I like the variegation in this grass's stripes. Green and creamy-yellow - a nice colour combination, and not too startling.